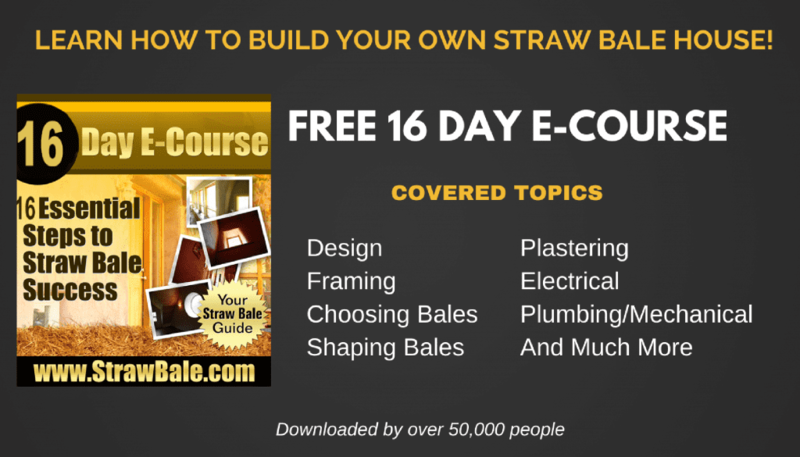 Sign up now to receive your FREE subscription to our “16 Essential Steps to Straw Bale Success” e-course. Every day for over two weeks you will receive an information packed lesson about straw bale construction in your inbox. Everything from Design, Choosing Best Bales, Creating Custom Bales, Creating Niches, Prep Work For Plaster, Hanging Cabinets, High Rain/Humid Environment Considerations, Baling Over Framed Floors, Plumbing, Electrical to Plastering Application and much more. Plus receive 25% off any of our products when you become an E-Course reader.